It takes a lot to make mints cool – but somehow Hint Mints have managed it. How? Well, by getting hip artist Josh "Shag" Agle to add his super-cool retro artwork to the tins. First up was a set of limited edition Christmas designs to the sliding tins. Now another three Shag designs have been added – including this one of a musical duo and black cat. 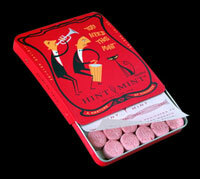 They are available pretty widely in the US and online at the Hint Mints website. If you want to pick them up in the UK, we found them in Harvey Nichols’ food department. As far as I know, they are the sole agents in this country – but if you know different, please let us know.